It's that time of year when children bundle up to protect themselves from the cold and snow. Use all that time you help with zippers and mittens in your classroom as a discovery lesson. Show pictures of children playing in the summer. Discuss with children the kinds of clothing we need in hot weather. Then show pictures of children in the snow and ice. Have children share the clothing that is needed to stay warm. You can help your young learners to consider the skill of contrasting by laying down two hula hoops. 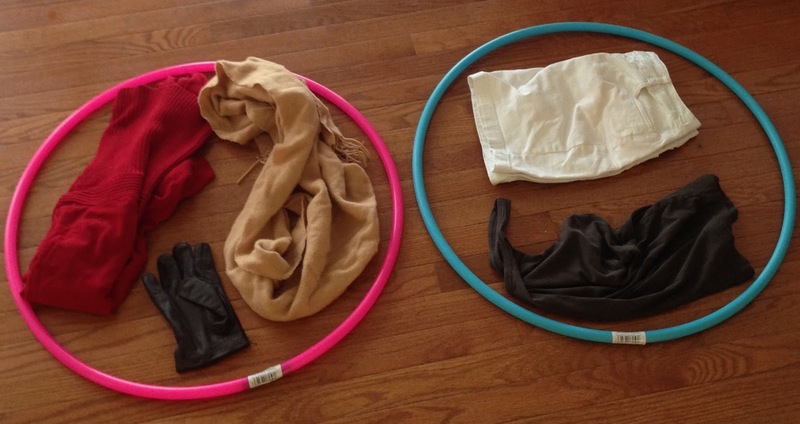 Use photos of summer clothing and winter clothing (or even actual clothing items) in each hula hoop. This is a wonderful visual to help children understand the school readiness skill of contrast. 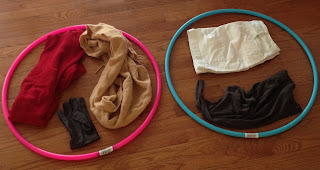 Later on, use the clothing, photos, and hula hoops as a center so that every child has a hands-on opportunity to contrast items. Then talk about types of materials. Have examples ready like wool, cotton, felt, leather, silk, etc. (You can get small pieces of these materials by visiting a local fabric or craft store.) 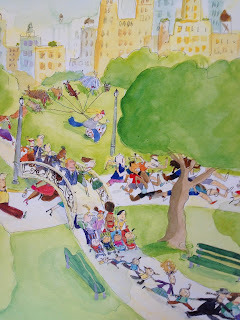 Encourage children to look at, feel, and smell each piece of material. Ask children to state which material they like best and to give at least one reason why this material is preferred. The goal of this kind of question is to encourage children to describe the material, not necessarily to find out who likes what material. The observation is then meaningful as children are asked to state a detail about the fabric. Being able to support a conclusion is another school readiness skill. Discuss the kinds of material that keep people warm in the winter and those that keep us comfortable in the summer. Conclude the lesson by having children look at their coats, hats, and mittens. Ask children if they can identify the materials used to create each clothing item. NAEYC - 2.B.04., 2.D.03., 2.G.04. Head Start - IV.C., V.B., VIII.B., XI.B. This week, our printable weekly activity highlights a strange plant. We use this fruit to teach math concepts. If you haven't signed up to receive these free activities, please do so in the box to the right. Staying on the theme of plants, we know you talk with children about the ways plants, animals, and trees change with the seasons. Use the idea that some kinds of trees lose their leaves in the winter to help children describe nature and their response to it. If you have classroom windows or can go outside to see deciduous trees, ask children to tell about that type of tree. You can always show photos of these trees, too. How does the tree look? Do you think this tree smells different in the winter (no buds, leaves, flowers, etc.)? 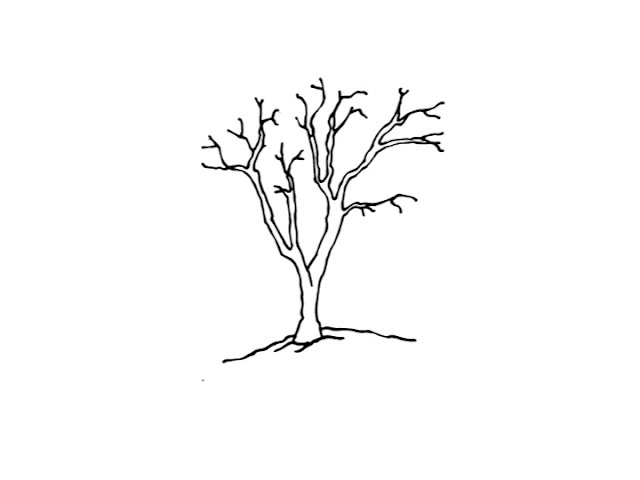 Might the tree sound different when the wind blows through it? (Children should understand that since there are no leaves, there will not be a rustling sound). Finally, one numeral that can be difficult for children is zero. Use this concept freely when talking about the number of leaves on a winter tree. "There are 0 leaves." Have children use the term in other fun ways in the classroom, too. "We see 0 monkeys in that tree!" Encourage families to say zero when discussing what children learned during the day. Head Start - VIII.B.1 & 2, X.A.1, & XI.B.1. Preschoolers easily confuse many words including plurals of common vocabulary such as sheep, goose, etc. How do we handle situations like this? We want children to use vocabulary correctly but we also don’t want them to stop experimenting with new words. Here is one method we’ve found helpful. We keep short notes on words we see children using incorrectly. Then we make it a point to model the correct use of these words. This helps children learn to listen to others and make changes in their use of words. For example, a child might say, “ I see lots of childrens on that page.” You could rephrase the child’s statement and say, “Yes, there are a lot of children on the page.” Reinforce the word, children. Count as a group. Reinforce there are 7 children. At that point you can even say, “We always say children when there is more than one child. We don’t say childrens.” Have the class repeat it together, while making eye contact and smiling at the child who had trouble. Talk with any children still having trouble and ask what they learned about saying the word children. Applaud them for being good listeners and learning from what you said. This way children learn to learn – and that’s important! Illustrations are from the book, Is There Really A Human Race? by Jamie Lee Curtis and Laura Cornell. 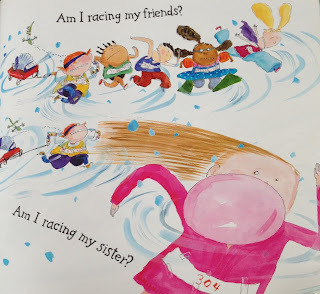 This is a wonderful book to use to encourage rhyming skills! Head Start – IV. A.; V.III. A & B. When a child doesn't know how to rhyme, the task of teaching this skill can seem overwhelming. The usual answer is to read books that contain rhymes, but this doesn't always help. Then we need to help children get in the "zone of proximal development." This means we break the task down into small components and moving the child, slowly, to our objective, in this case rhyming on their own. For rhyming, we suggest playing a game with two words. Simply say, "Do bat and cat rhyme?" Give lots of examples that do rhyme. Children can clap or jump...anything to indicate that two words rhyme. Reinforce by saying, "Yes, because the words sound alike at the end." When children have the sound of rhyming words in their head, give two words that do not rhyme like book and kitchen. Get excited when they say," No, those words do not rhyme." We encourage children to use silly voices to indicate a resounding no for non-rhyming words. This makes the "game" fun! Sometimes children think words like spoon and fork rhyme because they are focusing on the meaning of words. This means you have to play the "game" a lot and reinforce that rhyming is about the sound of the words - the ending sound. For more, view our video explanation.